it’s that time of the year again: fashion week season. and as always things kicked off with new york fashion week and after hours spent perusing http://www.style.com i’ve narrowed down my favourite trends! i love a pop of colour but there is just something clean and wholesome about an all white ensemble. Helmut Lang and Calvin Klein seemed to think so too. 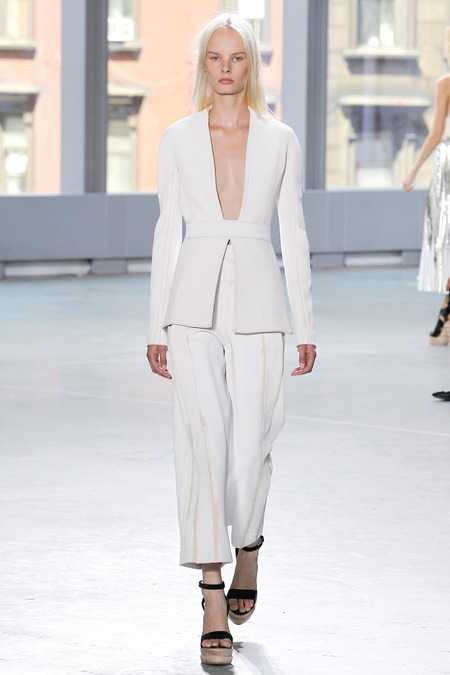 my favourite all white look from the catwalks however comes courtesy of Proenza Schouler. I love myself a good blazer and this belted waist version paired with slouchy trousers is classical yet current, casual yet chic. from lemony yellow to tangy orange, citrusy hues were all over the runway – from the lip colour on Prabal Gurung’s runway to a Rebecca Minkoff satchel to a DKNY sneaker to Monique Lhuillier sandals. my favourite is this Jenny Packham beaded dress and i love the whole overall barefaced, tousled hair look. fashion this year around wasnt just pleasing to the eye, it played with the sense of touch too. think ribbon detail on the Prabal Gurung catwalk to Christmas decor detailing on Vera Wang’s. i love how Carolina Herrera plays with sheer paneling and silk, seems like the designer decided to reach into her craft drawer and have a bit of fun. been putting off time at the gym for awhile? well its time to hit it with a vengeance and overdose on the crunches – bare midriffs were everywhere this season from BCBG and Alexander Wang to Vera Wang. this DKNY sports inspired look is a perfect way to show off those abs. one of my favourite Oscar dresses is the powder pink Ralph Lauren slip dress Gwyneth Paltrow wore to the ’99 edition. and this year’s runways from Jason Wu to Narciso Rodriguez took us back in time with their updated version of the slip dress. 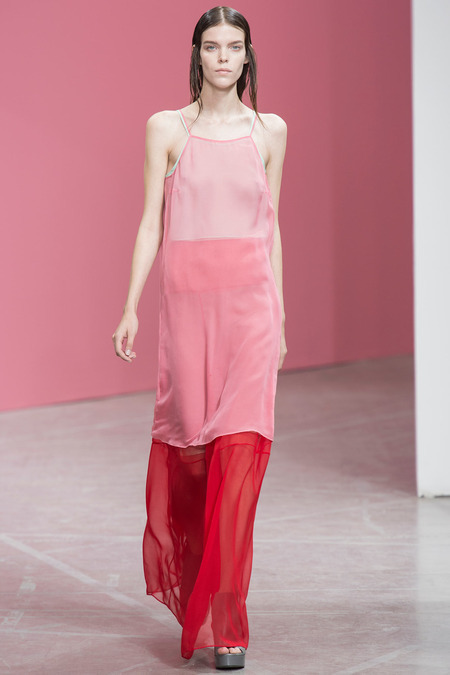 i love this blush red Theyskens’ Theory breezy dress. i was reading an article today on how writers are procrastinators, and that we are. i have started three blogs and after the initial enthusiasm maintaining it becomes a chore. hopefully this time around that will not be the case. for regular readers of my writing (are there any?) i have moved countries (again! ), said goodbye to a career in journalism and said hello to a lifetime of matrimonial bliss. what hasn’t changed is that i still have an opinion on everything – from my morning coffee to the situation in syria to the new york fashion week runways. instead of just talking to the walls i’ve decided to put pen to paper to share my wonderful views with you! and this time around i shall strive to be more regular in my offerings. till next time .. may the shoes be with you!